The Marsin family originated from the bishopric of Liege where they were seigneurs de Modave. Marsin's father Jean Gaspard Ferdiand de Marchin was a Marshal of France. During and after the Fronde he switched to the service of Spain. He was made a knight of the garter and a count. On 28 May 1651 he married Marie de Balzac d´Entragues daughter of the Marquis de Clermont. 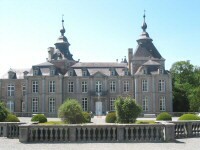 Jean Gaspard left his footprint by reconstructing the Château de Modave. Our Ferdinand de Marsin was born in Mechelen in February 1656. His mother was not that attached to Liège, and had him naturalized as a French national when he was only 5 years old. After his father's death Ferdinand moved to France in the same year. The reasons for Marsin to try his luck in French service were probably that his mother stood to inherit her family's estate in France. Marsin arrived in France at age 17 and received the new company 'Gendarmes de Flandres' created on 22 November 1673. This was part of the Gendarmerie and therefore Marsin was officially styled captain-lieutenant1. This charge of captain-lieutenant of a Gendarmerie company was very honorable and profitable. The downside is that the Gendarmerie almost always operated as one unit, and so Marsin was less likely to be mentioned in the media. On 2 september 1688 Marsin became a brigadier of cavalry2. In 1689 he commanded the Gendarmerie in Germany. On 30 June 1690 Marsin was wounded in a preliminary encounter of the battle of Fleurus, after the battle he was reported as a captain-lieutenant3. In Dangeau's journal he was however reported as commanding the gendarmerie4. In May 1692 Marsin was mentioned as a brigadier commanding the gendarmes5. On 30 March 1693 Marsin became a Maréchal de camp (Major-General)6. On 3 April it became known that he was to be assigned to Luxembourg´s army of Flanders7. on 15 or 17 July Marsin was in a skirmish between 60 French squadrons and 8 regiments (about 48 squadrons) of enemy cavalry camped south of Tongeren under Tilly . Marsin commanded one of the three French groups of cavalry8. The alliance troops made a hasty withdrawal and lost about 150 men. In the 29 July 1693 battle of Neerwinden Marsin was in the left of central first line, which consisted of cavalry. In this tiny command he had above him: Lt-General duc de Bourbon; Marshal of France de Joyeuse; the Duc de Chartres (Philippe II d'Orléans), and finally Marshal de Luxembourg. In the rather long siege of Charleroi (15 Sep. - 11 Oct. 1693) Marsin got command in the trenches 'on the right' on 20 September9. In february 1694 Marsin was made a knight of the order of Saint Louis. This was a nice distinction, but at the same time about 50 other senior officers were admitted10. In April 1694 Marsin was again designated for Luxembourg's army of Flanders11. The king was to command it in person, but in the end the Grand Dauphin did. It´s stated that Marsin participated in the march from Vignamont to the bridge of Espierre in August. In 1695 Marsin was part of Boufflers´s Meuse army. In October 1695 Marsin was destined to winter in Tournay under Montrevel11. However, in November Saint-Silvestre Directeur Général of cavalry in the Piedmonte army left the service, and Marsin was appointed to replace him. 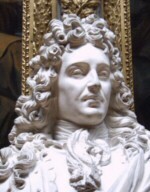 In early May 1696 Marsin took his leave from Versailles to go to Italy. On that occassion he represented his financial misery to the king and got some kind of reassurance for his creditors. This was backed by the value of his office of captain-lieutenant of the Gendarmes de Flandre. In March 1696 Marsin succeeded in selling his charge as captain-lieutenant to the Chevalier de Roye. The price was less than 50,000 écu's. After Piedmonte had left the alliance, Marsin reached Crescentino on 4 September, with 200 gendarmes and 600 cavalry and dragoons. On 18 September 1696 the French started to besiege valenza. On 19 September Marsin joined by attacking from the Monferrato side13. At about 8 October 1696 this siege was however broken up by a treaty that gave Italy a neutral status. Marsin then went to serve in Flanders again in 1697. He was present in the 22 May 1697 siege of Ath, where on 5 June Catinat designated his to command the assault. This did not come to pass because that same day Ath surrendered14. The siege of Athe was the last major operation of the Nine Years War, that ended in 1697. In June 1701 Marchin became ambassadeur extraordinaire to Felipe V and he would accompany him to Italy. There he was wounded at Luzarra. At the end of 1702 he was recalled. On 2 February 1703 he became a chevalier des ordres du roi, and this marked the beginning of the high-tide of Marsin's career. With political aptitude he gained the trust of Felipe V, d'Ursins, Vendome and even Maintenon and became en vogue for a while. He was present at the taking of Breisach and Landau and at the victory of Speyerbach in 1703. In Bavaria Max Emanuel was the supreme commander of the combined forces and the experienced elector really acted as such. This had led to constant quarreling with Villars, who finally begged to be replaced. Versailles was thus looking for an able general who could also cooperate with Max Emanuel. After Coigny refused the choice fell on Marsin who went to Bavaria with a considerable corps and supply train. The king had given Marsin a package that he was to open after Villars had returned to France and he himself had arrived in Bavaria. Upon opening he found it contained his appointment (dated October) as Maréchal de France15. His first action was to take Augsburg together with Max Emanuel. Up till the arrival of Tallard in Bavaria Marsin probably let Max Emanuel have his way, and things went well till the defeat suffered by Arco at the Schellenberg. Tallard was however not prepared to let Max Emanuel have his way. Counting that at the junction of the two armies only about 6,000 Bavarian troops were present one can assume that Marsin and Max Emanuel were more upon an equal footing at Blenheim. At Blenheim the command of the 'combined' army was as follows: Max Emanuel commanded the left, Marsin the centre and Tallard the right. Max Emanuel and Marsin's army got away from Blenheim relatively undamaged, and so the defeat did not substantially damage Marsin's career. After recrossing the Rhine he commanded in Alsace for the rest of 1704. In 1705 he served under Villars in Alsace. In 1706 Villars refused to go to Italy with Orleans in order to replace Vendome. Marsin was therefore chosen to accompany Orleans on the important assignment to keep Eugen out of Northern Italy. Orleans had strict orders to obey Marsin's advice, but it seems that Orleans really acted as commander while Marsin was indeed only advising in order to prevent blunders. Anyway: Orleans and Marsin were outmaneuvered all the way by Eugen till they finally had to face him at Turin itself. At this crucial point in the campaign Marsin is said to have prevented the French army from taking an offensive action to prevent the attack on the lines of Turin. In the ill-conducted defense of these on 7 September Marsin was mortally wounded, captured and died the same night. Perhaps one can sum up Marsin's abilities in the field by stating that for him political aspects outweighed the military. His career doesn't show remarkable successes or defeats, or it must be that out of nothing he arrived at the top of the French military. On account of his skills as a general one can argue that at Blenheim he was not defeated but retreated in good order. One can also argue that at Turin he put up a good defense and that his defeat was only caused by La Feuillade and Albergotti failing to support his section of the lines. This however also explains that being a commander is something quite different than being only a general. Though holding his section of the front at Blenheim he failed to do anything to help Tallard. In the maneuvers that led to the battle of Turin he failed to direct Orleans to effectively block Eugen's advance. Finally at Turin itself he had the power to direct the defense to a certain course. In stead of doing this he preferred not to strain relations with La Feuillade and suffered a complete defeat. He is said by Saint Simon to have been a very small man, but very active and a great conversationalist. 1706: Commanding with Orleans and La Feuillade at Turin and killed in action. 9) Marsin in the siege of Charleroi: Lettres Historiques page 456. 10) For the huge inclusion in the order of St. Louis, e.g. Europische Mercurius for February 1694. 11) Dangeau under 17 April 1694 for Marsin appointed for the 1694 army of Flanders. 12) Dangeau under 23 October 1695 for Marsin´s appointment for Tournay. 13) Marsin at Crescentino and in the Siege of Valenze Europische Mercurius 1696 page 182 and 220. 14) Marsin in the Siege of Ath Europische Mercurius 1697 page 324. 15) Dangeau under 10 December 1703 for Marsin´s appointment as Marshal of France, the date comes from a biography.